A Michelin-starred chef who denounced the mindless violence of hoodlums on the fringes of France's "yellow vest protests" said on Wednesday he was contemplating his future after arsonists struck for a second time in two weeks. Yannick Delpech, 43, who became the youngest French chef to win a star in 2000, said the blaze was started outside the kitchens of his L'Amphitryon restaurant while three employees were working inside. "I am in total shock. Today my thoughts turn to the safety of my staff, my clients and myself. In the coming hours, I will make a decision about my restaurant's future," Delpech said in a statement. The anti-government street protests have convulsed France for three months and posed the greatest challenge to President Emmanuel Macron's authority since he took office in May, 2017. In late November and early December, rioters ran amok during successive protests in Paris, defacing national monuments, torching cars and ransacking private property in the worst unrest seen in the capital in decades. Violent clashes with police, largely blamed by officials on hard-left and ultra-right militants, persist at the weekly demonstrations in Paris and other cities across France including Toulouse, near where Delpech's restaurant is located. In January, the chef wrote on Facebook that he would never cower before a minority that sought only chaos and cave in to intimidation. "I will never be held hostage by conspiracy plotters, anarchists, racists who hijack a social movement," he wrote. Days later, vandals graffitied "collabo" (slang for collaborator) and another slogan with the sign of "GJ", the acronym used for the Gilets Jaunes, or "yellow vests". Not long after, arsonists struck a first time. The "yellow vest" movement erupted out of nowhere in November over the high cost of diesel, and was named after the high-visibility jackets motorists in France must carry in their car. It quickly morphed into a broader revolt against Macron and inequality. 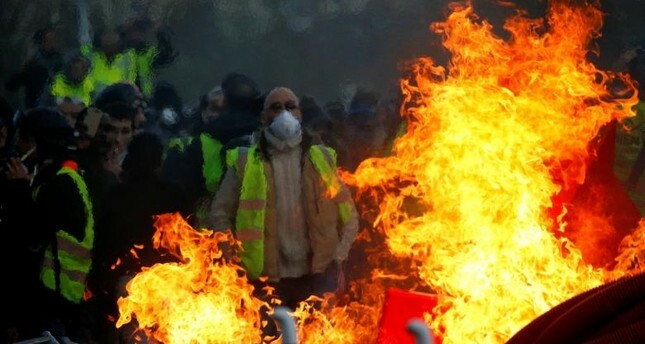 "He didn't accuse the 'yellow vests' of causing the first fire and makes no link between the two blazes," an associate of Delpech told Reuters. "What he criticized, was the violence of thugs on the movement's fringes." Delpech rebuilt his business after a fire gutted is restaurant in 2011. The restaurant's seven-course 180 euro ($203) menu includes champagne and oysters, roasted lobster and suckling veal with black truffle.